Although Valentine’s Day is said to be the holiday that celebrates love, it doesn't mean it’s the only day to express our love for others. For me, it’s just a gentle reminder that God is love and He loves us immeasurably, and for that reason alone, we should also love others the way our Father in Heaven has first loved us and continuously loves us. We should love one another every day and not only on Valentine’s Day. That being said, it doesn't mean we can’t and shouldn't celebrate Feb 14th. Speaking of, here’s how my Valentine’s Day turned out to be. It was just a typical day actually. My husband is back on graveyard shift and the first night is always the hardest for me. It’s just so difficult to adjust. It’s not that easy to sleep without your husband beside you. In short, I didn't even get a decent sleep at all. I was still wide awake until almost 5 in the morning. He arrived home at I guess past 9AM. I can’t really tell 'coz I was really so knocked down at that time. He kissed me like he always does every time he gets home, and then went straight to the bathroom. A few minutes later, he was poking me with something as he was uttering the words, “happy valentine’s Day, mommy…” I slowly opened my eyes and saw his gorgeous face. 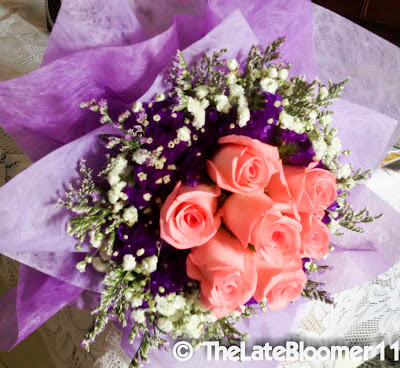 And I thought to myself, “oh I love this man...” Then in my astonishment, he handed me a bouquet of flowers. In an instant, I was no longer sleepy! For the first time, after seven years, I finally received flowers from him. I couldn't take away the smile on my face. It’s definitely, by far, the best Feb 14th of my life.